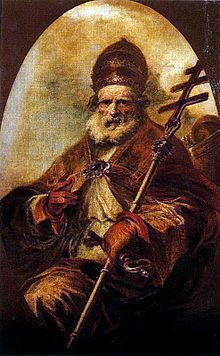 Pope St Leo was born in Tuscany, Italy. Following the death of Pope Sixtus III, Pope St Leo was unanimously elected to succeed him. He described himself as an unworthy heir and deputy of St Peter. Pope St Leo helped centralise spiritual authority within the Church and reaffirm papal authority. He once wrote: “The care of the universal Church should converge towards Peter’s one seat, and nothing anywhere should be separated from its Head”. Pope St Leo’s many writings remained highly influential long after his death. He is also remembered for persuading Attila the Hun and his armies to turn back from their planned invasion of Rome. Pope St Leo’s Feast Day is the 10th November. He is a Doctor of the Church, one of just 35. You chose him to shepherd Your flock.